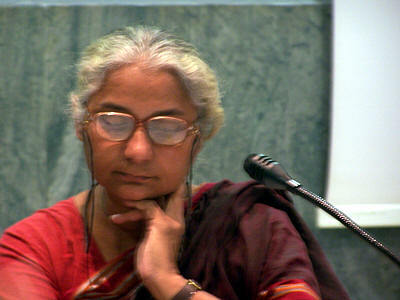 Medha Patkar, the famous activist from India fighting for the rights of poor and voiceless persons, was in Bologna at a meeting organised by CGIL, the workers union. I was able to record most of her speech and a transcription of this speech is presented here. Unfortunately, I had another appointment and near the end, I was forced to leave the meeting, so the last part of her speech is missing from this text. 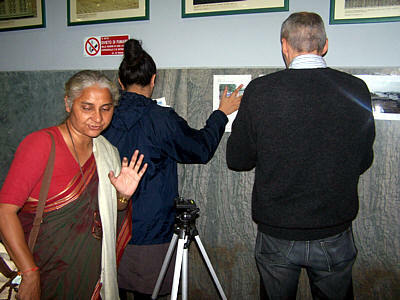 I had met Medha for the first time, a few years ago, when she had come to an AIFO meeting in Rome. I agree with most of what she says regarding SEZs, the corruption that pervades most of our system in India, the lack of care about what happens to the poor and marginalised persons for most of well to do India, that is as self-centred like most well-to-do persons in the world. I also agree that the present dominating idea of development is result of a particular view point of developed world that has its roots in colonial past, industrialization and in a belief that nature is for man’s exploitation and thus for most persons the more things you have the better it would be. But I am not sure if poor, just because they are poor, would be happy with another idea of development, for example, the ideas of self-contained mutually dependent small communities with limited material needs envisioned by Gandhi and some other thinkers. 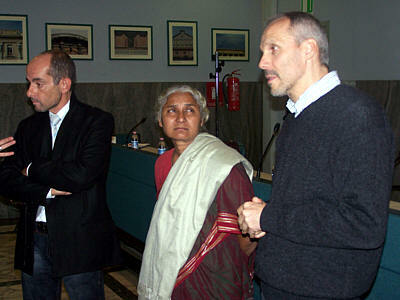 (Picture: Medha with Vittorio Silingardi in gray sweater, from Bologna CGIL). I feel that most people are striving for that same kind of material development, and so I am not so sure if poor in India would be against the idea of small cars only because these pollute and create traffic problems. Probably people would rather ask for less polluting cars, more sustainable & renewable energy production, more efficient traffic management but to have the independence of their own cars. As someone, who is convinced about value of non polluting technologies and who uses bicycle for most of his transport, I do look around and see that majority may be willing to admire such idealists (probably secretly many of them do think that these idealists must be a little crazy) but are happy as they are, each in his/her own car! It is possible that such a view point is linked to my experience of living in Europe. Any way, that is enough of the introduction! So on with Medha’s speech. Read the transcript of her speech below. Various leaders and activists of the labour union, it is a pleasure and a privilege to have a dialogue with you all today. You are representatives of hundreds and thousands of workers in this part of the world and sharing commonality of perspectives as well as strategies with you can go a long way. I also have two of our Indian supporters here, one a young volunteer and environmental scientist, Anita Kapur from London and then, Sunil bhai who is from Bologna itself. Friends, as you all know, I come from the National Alliance of the People’s Movements in India and also from the struggles in the river valley of Narmada. 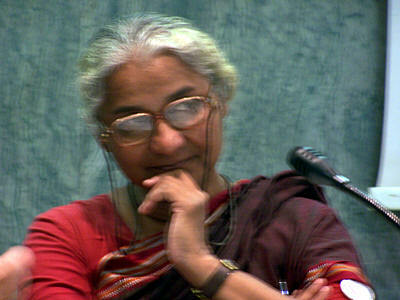 These years and decades long struggles are still on and have been facing newer challenges because the whole paradigm to which the state and the corporates are committed to, is certainly bringing an onslaught on the population including the indigenous people, farmers, the working class people, artisans, the fish workers and almost 95 or more percent of the working classes. On the other hand, in a country like India, there are laws that are the British regime laws that still continue to operate and are used for acquiring people’s resources, which are the resources of livelihood, the private property and the most important, the common property resources, which are the life support sustains of the population. And those laws really can give the state the power to acquire anything and every thing. It is said in these laws that “land and every thing attached to the land” – it may be the metal underneath, it may be water in the aquifers, it may be the surface water, the forest, the trees, fish and the aquatic wealth, and of course, the houses and the farms. This principle of “eminent domains” which is operative throughout the world, it is clearly reflected in that land acquisition act. So it was legalised in legal terms and it was also legitimised by the forces of the civil society, which would otherwise stand by these persons who were saying no to land acquisition, to usurpation of their resources. That (support) was not forthcoming. 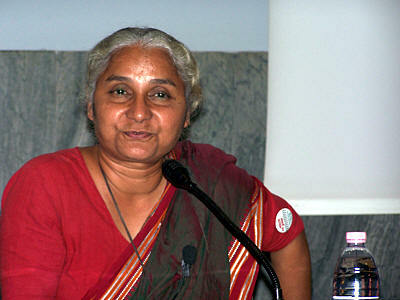 But the people in the Narmada valley went ahead and the struggle is still on, even after 22 full years. The main dam which was to submerge the communities up to 214 km is stopped again all though the wall is there. That wall has reached 122 meters but it has still 17 meters to go. 200,000 and more persons continue to stay in the communities, refusing to move out. There is no land to offer to them, the rehabilitation is only on paper. The legal judgements and the laws are being violated and hence the dam (construction) was stopped again. We are also questioning the centralised-based development paradigm and planning process. When centres are in the capitals of the nation states, the communities, the rural as well as the urban communities questioned, “Who decides what is development”? And through what democratic or undemocratic procedures and processes do they impose these plans upon us? It was also bringing out the ultimate ways of managing the resources, beginning with their small units that are the communities, which are also the ecological units. So that there will be no displacement and eviction of people from their cultural, environmental milieu and also from there own kinds of life-styles and economies. It did bring out the whole paradigm of ultimative planning such as the decentralised water management. We also said that we want the trees and the enterprises which would take up the process of value addition to the natural resources. But this should not be taken up at the cost of natural resources based communities but should rather be involving them, informing them and accommodating them, serving the purpose of complimentary economic activities, which would generate not just incomes but also employment opportunities in a thickly populated country like India that is almost 20 times the population of Italy. You can understand that the thickly populated communities of farmers, labourers, fish workers and indigenous people who get affected in the form of an attack of industries. Thus there is bound to be conflict between the state and the people. That is what this conflict looks like and has emerged, this conflict between state on one hand and the communities that are based on living on natural resources and have the human power. There may be the IT parks, the information technology parks but only 50% of the land which is being given to the corporates is to be used for industries or enterprises, which are shown as income generating and employment generating. Rest of the land the corporates are allowed to be used for hotels, restaurants, gardens, swimming pools, real estate development activities, that is building and construction activities. So these SEZs, the special economic zones are considered by the people’s movements of farmers, fish workers, of labourers and many of the trade unions also join us because the labourers inside the SEZs are also going to be exploited, they all join us in calling these as the special exploitation zones. These battles have taken a new turn and severe repression of people who are questioning SEZs is also taking place. More than 500 such zones are approved but wherever the new industries are coming up or the old industries are functioning, they also want to be part of the special zones, where there will be no or very little of labour laws applicable, environmental laws and environmental impact assessment laws will not be mandatory. And, they will have their own rules with the commissioners appointed by the corporates. There is a whole trend of bureaucrats from the Government departments taking 2 year leave and joining the corporates, of course with all their files, information, links and relations. This is the trend that we all are opposing but the point is now that the whole industrialisation in a country like India is taking this new trend, which is a world level phenomenon anyway. So they will not care about the local resources, local communities, the sources of livelihood. How much employment opportunities do they kill and how much employment opportunities they really create, there is no account of that. They are not accountable either to the state or to the civil society including the people who are feeling their backlash, their impact. In this context, I want to bring to you the story of Singur. A project of Tata and Fiat, they have formed a joint consortium, is going to come up on the land in the state of West Bengal. And yet in West Bengal problems are there, coming up in place to place. In Singur there was a forced acquisition of about thousand acres of land, 997 acres, for a project that was known as Tata’s small car project. A car that will cost only 100,000 Rupees. Already 70% of India’s car industry is flourishing with small cars. But today in the Indian situation with the thickly populated country of 100 crore persons (a thousand million persons), the place for the thousands of cars coming out on the roads is the place occupied by four lane and eight lane highways and flyovers. This is the so called infrastructure development supported by the Asian Development Bank and the World Bank, at the cost of urban poor and against the working classes, who are construction workers, hawkers, small scale industries, domestic workers, who have no place even to stay. Large scale evictions are also opposed by all of us. We have a strong movement of the urban poor as well, claiming their rights to housing, social amenities and also for the employment guarantee. But for the migrant workers, as they are mostly, labour laws are not being followed. So in this context more of the small cars are to be produced, the transport policy is going in the direction of privatisation of a different kind. Private transport instead of public transport is going to create its own problems which are going to be very difficult to handle. Coming back to the story of the land where the factory is supposed to come up. 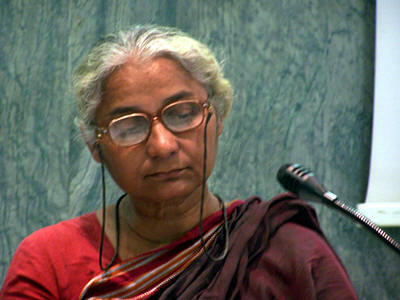 In Singur when they decided to acquire the land almost all the farmers except for a handful of absentee landlords who were not staying on the land and had already moved to non-agricultural jobs, all the others including landowners, the share croppers, the landless labourers, the artisans in the area opposed the project. The land being most cultivable and of prime quality with 3-4 crops being taken up on the land, people said no to the project and they did not want to give up their only source of livelihood. Some of the family members may even agree to take up jobs in some industries, they wanted to hold on to that land because all of the families and all of the adult members also were not finding it easy to find employment. In the situation the Tata decided that they would like to have that land obviously because of the fact that land was very close to Calcutta, just 50-60 km away from the capital of West Bengal state and also close to the highway, the expressway, and they wanted everything nearby, the infrastructure is readymade and available. I was arrested four times within seven days but every time the court released us. The harassment and the police encircling were finally stopped. Even today the police troops are on the lands of Singur where so much of beatings, so much of repression has already taken place and is taking place. Meanwhile a few hundred acres of land, the people agreed to give away because as I said, either they were in other jobs or are absentee landlords or some of them were with the party in power. But the rest of them, at least 40% of them landowners, refuse to accept any cash. Their struggle is not just a few hundred families, it is a few thousand families with landowners, the share croppers, the labourers, who are all opposing the project.